Irrigation experts discuss the ins and outs of soil moisture sensors. Using soil moisture sensors is one way irrigation professionals can accomplish their goal. Mecham, the industry development director of the Irrigation Association (IA), discussed soil moisture sensors as a water management tool during an IA webinar in March. The presentation included information from Diganta Adhikari, product engineer at Irrometer Co., a water management tool manufacturer in Riverside, Calif., and Jon Peters, director of sales at Baseline, a manufacturer of irrigation management products in Boise, Idaho. The experts discussed common types of soil moisture measurements and how the process can save water, money and resources. Adhikari cites two studies that show the water and energy savings that can come from using soil moisture sensors to make irrigation decisions, one of which applies to landscapes. It compares a stand-alone timer with a timer that has a soil moisture sensor built into the control. The timer with the sensor showed a 39.3 percent water savings, equivalent to $176 per month, based on the cost of water in that area. There is terminology specific to soil moisture that irrigation contractors should know to understand the process. Saturation is when the soil is filled with water and almost all the air in the soil has been displaced. Field capacity is the “ideal condition we’re looking for where plants are the happiest,” Mecham says. It’s the level of soil moisture left after gravity has drained out any excess. At field capacity, there is adequate moisture left in the soil, but there is also air and oxygen for the roots. Permanent wilt point is the minimal point of moisture a plant requires. At this point, there may be some moisture left in the soil but not enough for the plant to survive. Oven dry means soil is dried in an oven and nearly all the water is removed. The weight of the oven-dried soil is used to provide a reference to measure the field capacity, MAD and permanent wilt point. Mecham explains that a plant’s root zone is typically divided into four parts, indicating how a plant takes water out of the soil. Though the top quarter of the root zone provides 40 percent of a plant’s water, he recommends placing a soil moisture sensor in each of the four areas of the root zone to monitor how the water moves through the zones and the soil profile. Mecham groups soil-moisture-based controllers into two categories: those with sensors that enable irrigation on demand when soil has dried out and those that disable irrigation when soil is accurately moist. There are a variety of soil moisture sensor technologies used in the industry, such as electrical resistant granular matrix sensors, electrical conductivity probes, frequency domain reflectometry sensors and tensiometers. The webinar focused on volumetric and tension-based soil moisture measurements. Volumetric soil moisture measurement gauges the amount of water in relation to the total soil mass, expressed as a percentage generally ranging from 8-45 percent. A volumetric soil moisture content sensor provides a number contractors can use to control the irrigation system and know when to start and stop watering. 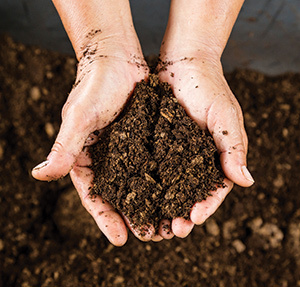 “Imagine you go out into the landscape or field and dig up a cubic foot of soil that weighs 100 pounds and you cook it until it’s dry and it weighs 50 pounds—that would be 50 percent volumetric soil moisture content,” Peters says. Soil water tension is the physical force or suction the roots of a plant have to apply to the soil to extract water and nutrients. Adhikari compares the process to a dry sponge that’s been dunked in a bucket of water. At first, water will drain out of the sponge freely. Then water will drain out of the sponge when it’s squeezed. Eventually, no matter how much force is applied, no more water will drip from the sponge. “How much force or tension do the roots have to exert to get moisture out of the soil?” Adhikari says. “Are the plants in a happy state, such as saturation, where barely any force is required to get the water out, or are they in a state where a lot of force is required to extract the water?” With tension-based equipment, a reading closer to zero indicates saturation and higher numbers indicate drier conditions, Adhikari says. Get more details on the IA webinar, including how to watch the recorded version, here.